Are you finding it difficult to get a good sleep at night no matter how exhausted you are? Are you finding yourself awake at strange hours of the night anxiously watching the clock tick away the hours? If so, check out some of our sleep inducing marijuana strains that are sure to provide you the goodnight's rest you have been longing for. Insomnia is a common problem that diminishes your energy levels throughout the day and be the cause serious health problems. Don't let insomnia take over your life. We offer you a wide variety of strains that will assist in relaxing your body and restoring your mind to a well regulated sleeping pattern. Allow some these effective and great tasting strains to be part of your nightly ritual. Going to bed does not have to be a chore anymore. Pick up a good book and choose the strain that is right for you. You'll be out in no time! Blueberry Haze, a tasty flavored bud offering a pleasant high. Good for toning your energy down right after a tiring day. Pace yourself because also much of this sweet treat will have you on an one way trip to dreamland. Lineage be..
From the great white north comes a popular medicinal strain that combines all the flavor of Bubba with all the potency of OG. Not to mention, it yeilds better than either of the two. Talk about making your parents proud. Don't let th..
Lineage Purple Kush is one of those rare strains which are purely indica. This is apparent from the vivid colors of its flowers and its potent taste, which sets it apart from the other hybrid strains. It was created by a group of br..
Lineage and THC Content MK Ultra is a hybrid strain of cannabis with a strong leaning towards indica. In fact, it is one of those hybrid strains with the highest indica dominance. The alluring name of this strain is inspired by the ..
Gobbstopper is a berry flavored indica strain and the second entry in Alphakronik Genes' Wonka Series. Cultivated by crossing Purple Urkle and Sin City Kush, Gobbstopper's long-lasting fruity taste profile opens up on the nose with s.. Ace of Spades is a creation from TGA Subcool Seeds that takes advantage of the popular sweet and sour blend that never goes out of fashion. A crossbreed of Black Cherry Soda and Jack the Ripper, this strain of marijuana has an earthy..
Sun Ra is a strong combination of Colorado Seed Inc.'s many strong sativas, Sunburn and Rebel God Smoke. This heady synthesis harvests a strain that stimulates the mind and body with upbeat energy. It carries an appealing and spicy o.. 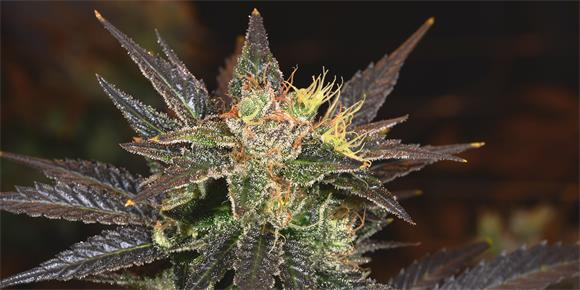 Poison Haze is a menacingly-named sativa that builds on some very strong genetics . The strain is a spin-off of African landrace Durban Poison and staple sativa Haze. It contains a powerful, citrus odor and has an enlightening mental..
Like the popular comic series, Night Nurse is a strain dedicated to taking good care of you. Night Nurse provides a full body recvery as it induces a sleep that is sure to bring you the relief you are looking for. This indica-dominan..
Acclaimed from mysterious breeders who wanted to prepare a potent and infamous strain, Pure OG is a SFV OG Kush inbred that's put together a 60/40 predominantly indica balance. It reflects the flavors of her original predecessor and ..
Northern Lights stands among the many prominent strains of all time, a pure indica cherished for its resinous nuggets, fast flowering, and resilience while in growth. Itself a descendant of indigenous Afghani and Thai landrace strain..
Stevie Wonder is a predominantly sativa hybrid named after the well known Stevie Wonder is a predominantly sativa hybrid place on Earth from the famous tetrad of Trainwreck, Sensi Star, Bubba Kush, and Blueberry. These large, frosted..
Pineapple Upside Down Cake is an original creation from renown Humboldt Seed Organization. The strain sets the bar exceptionally high for the standard of unique organic compound (terpene) profiles. Pineapple Upside Down Cake is the p..
Bubba Kush is an indica strain that has gained notoriety in the U.S. And behind for its heavy tranquilizing effects. Sweet hashish flavors with subtle flavors of chocolate and coffee come through on the exhale, delighting the palate .. This strong, kushy, purple indica draws largely from its Purple Kush Starship roots is an outstanding strain with a strong body high and almost muscle-relaxing effects.Ghost Ship is a predominantly indica combination of Purple Kush S..
Saturn OG is a hybrid strain with mysterious beginnings, however its earthy citrus and diesel flavors confirms its close relationship to OG Kush. Its undocumented origins result in this strain of cannabis being labeled as indica, sat..
Royal Kush by G13 Labs is a king among hybrids, delivering strong trance-like effects with a earthy, skunky fragrance. This sensible hybrid descends from the renowned line of Afghani and Skunk #1, two strains that have gained legenda..
Aurora Indica, cultivated by Nirvana Seeds, is a 90% indica combination of Afghan and Northern Lights. Fulfilling our expectations an indica, this strain of cannabis produces heavy full-body effects as well as a sedating transcending..
Blue Dynamite, created by Next Generation Seeds in Canada, is a indica-dominant strain that provides heavy mind-and-body relaxation next to a fruity, hashy taste profile. This powerhouse indica was bred from a B.C. Grapefruit clone r..
A blend cross between Sour Diesel and Ghost OG, Earth OG is a cerebrally-focused hybrid with uplifting and happy effects. As its name suggests, this cannabis strain incorporates an appealing, earthy fragrance with sour lemon underton..